Upon moving to Byron Bay for the summer I have decided to embrace the cliché and attempt to become a spiritual being. Or at the very least, slightly more enlightened. Being rather clueless in matters of the spiritual realm I figured that it would be fitting to start my quest for self-betterment with regular yoga classes- naturally, because spiritual people are always into yoga. I've always wanted to embrace yoga but, unfortunately, past experiences have ensured that I've found it to be a pretty dull practise. As far as I'm concerned, not a whole lot happens. And when it does, everyone is so smug about it, being all bendy and holier than thou to the point of intimidation. Ignoring my reservations, I am approaching my Byron stint with a fresh outlook. I will become a spiritual (and flexible) yogi. Or, at the very least, I will attend yoga classes twice a week. Enlightenment should follow close behind. The first problem I encountered was where to commence my journey. 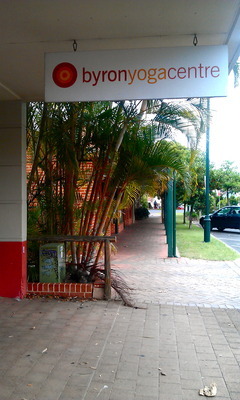 Byron must have the most yoga studios per capita of anywhere in the Western world. 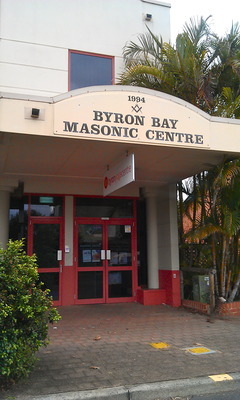 Following a friend's recommendation, I settled for the Byron Yoga Centre. This choice was made all the easier by the fact that the student run classes cost a discounted fare of $8. Auspiciously located in an old Masonic Lodge, Byron Yoga Centre is one of Byron's longest running yoga schools and offers daily general yoga classes as well as workshops and annual yoga and health retreats. Upon arrival I was more than a little disconcerted to see that the assembled members of the class were each carrying foam blocks, blankets, a bolster and some sort of strap. Nadine, the trainee teacher, quickly explained that these props were designed to aid with some of the more difficult poses. Naturally, I relied heavily on these blocks and bolsters during the ninety-minute class. Having worked my way through a range of movements (some a lot tougher than others) I found myself surprisingly relaxed. Not exactly "Zen" like, but progressively calmer and more flexible bendier all the same. Whether or not I can commit to making this a regular practise or not remains to be seen. However, I am slowly finding myself coming round to the idea of actually become a yoga regular. The spirituality, on the other hand, may prove to be a little harder to come by. http://www.tonicosteopathy.com/ offers a wide verity of Body Treatments, such as: Yoga therapy, Myotherapy, Remedial/Deep Tissue Massage, Cupping, Dry Needling and Pregnancy Massage.